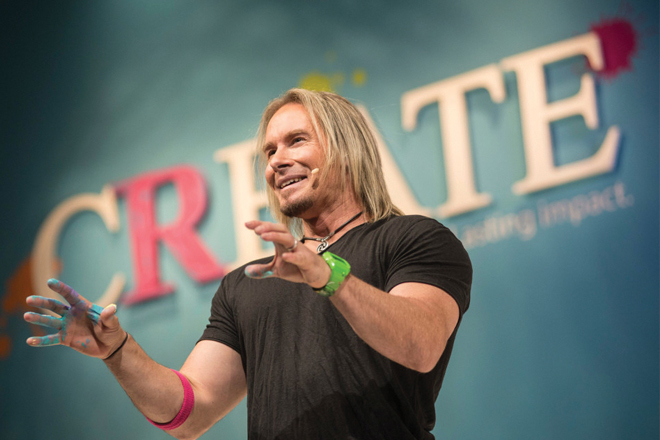 Disciplined creativity is a long-term growth strategy, according to Leadership Awards Lunch speaker Erik Wahl. Getting it right starts with commitment from the top. Erik Wahl is an artist, TED speaker and best-selling author of books including, “Unthink” and "The Spark and the Grind," which outlines the components of translating ideas into action. As the father of three sons, he also cares deeply about students and ways to more effectively engage them — in his words, “to spark passions and ignite life-long learning.” He is known to electrify audiences by creating large-scale artworks as he delivers inspiring presentations. Excerpts from his interview with Net Assets. Net Assets: Independent school business officers work in the creative environments of K–12 schools, yet they have rigid (or compulsory) responsibilities involving matters like regulatory compliance in HR and tax, to name just a few. What’s the business case for them igniting what you call the “power of disciplined creativity” within themselves? When: Tuesday, March 5, noon to 2 p.m. Learn more and register for 2019 NBOA Annual Meeting. Wahl: Efforts to court creativity translate to serious money. The top 1,000 public companies spent $680 billion on innovation in 2015, according to PricewaterhouseCoopers’ 2015 Global Innovation 1000. Yet the same study found no statistical relationship between increased innovation spending and sales growth, operating margin, net profit growth or total shareholder return, among other measures. In fact, the study’s 10 most innovative companies based on performance (led by Apple, Google and Tesla) cumulatively outperformed the top 10 spenders by nearly 10 percent — a trend that has held true for the last six years. Clearly, there is a tangible difference between treating creativity like a supplement and treating it like the ecosystem in which your company breathes and operates. While casual dress codes, retreats and brand renovations can be effective additives in the body of a highly creative ecosystem, they are merely antacids in an organization that does not breathe creativity. The bottom line is that the power of disciplined creativity is a long-term growth strategy. Think about the companies that are fading away because they only focused on their short-term goals and objectives: Kodak failed to plan for and accommodate the wave of digital photography that overtook them. Nokia was one of the first smart phone providers but failed to keep up with a lightning-quick software evolution. Blockbuster Video refused a partnership with Netflix and was cut out of the digital entertainment revolution. There are so many examples of mega-corporations who didn’t make innovation part of their everyday operations and paid the price. Quite simply, organizations that don’t bake innovation into their every strategy, operation and goal put their competitive edge at great risk. Net Assets: How can business officers become more agile or adept with the creative process? I could predict a future trajectory of success for any industry, any industry or organization, or child by asking one simple question: What is your definition of failure? Wahl: I would encourage them to not be afraid to fail. In fact, if you don’t fail, I would say you aren’t trying hard enough. I could predict a future trajectory of success for any industry, any industry or organization, or child by asking one simple question: What is your definition of failure? If your definition of failure is consumed with weakness or loss or bankruptcy, then your ceiling remains at a very specific level, you insulate yourself from challenges or external environments, and you can only go so high. By comparison, if you define failure as research and development — an opportunity to adjust, advance forward, fail forward — the sky’s the limit on how far forward you go. Every time you come to face with fear, you become stronger, more courageous and more confident. Net Assets: You have written, “In order to free your own originality, you need to be willing to stop doing only what’s required and expected of you, and start doing the things that only you can do.” Time is the obstacle. How can independent school business officers make space for going beyond what’s required and expected? Wahl: Invest in a weeklong time audit, in which you write down to the minute how you spend your workday. You’ll see the hard truth about where you’re spending it wisely and where it’s being wasted. Are you spending the right proportion of time on the most important steps to meet the most important goals? Are you holding or attending meetings for issues that could be handled with fewer people, an email or a phone call? What would be better delegated or eliminated completely? Where could you use an efficiency upgrade? What processes no longer serve the organization’s mission? There are always core responsibilities you need to handle. But how you handle them can create a shift in time and efficiency, opening space for creativity to enter. This is all lip service, however, without executive buy-in. Your organization needs to be committed at every level to innovation as a value. The secret to trusting the creative process lies in embracing the duality of creativity — that it is both a fresh idea and a fierce drive, both at the same time. Applying this to your day-to-day requires an ability to know which is needed during the course of creation. While you might assume that ideation is the beginning of the creative process, this isn’t always the case. Attach yourself to the work: The single greatest benefit in being a constant creator is that the process doesn’t just improve what you create, it improves who you are. When who you are is attached to what you do, striving for excellence excites you instead of burdening you. Your drive to see an endeavor through is fueled by passion and purpose instead of mere duty or obligation. There’s a tangible difference. Don’t aim for balance. Take courage and aim for integration — the folding of all you are into what you do. Defamiliarize the ordinary: It’s long been known that you need to do new and different things for your brain to stay active and fully functioning. You need to develop new neural pathways and introduce yourself to novel experiences. Sparks arise when you discover nuances you hadn’t seen before and connections you’d never made. The fact is, original breakthroughs rarely occur in familiar locations. This includes the space in our own minds, where we carry preconceived notions about the people and places around us, and where current knowledge resides. So, the trick is to remove yourself from your familiar places, or else discover what is unfamiliar about where you already are — even if it’s as simple as taking a different way to work, or going to lunch with someone you barely know. Stay foolish: Like a child learning to draw, just draw. Don’t try to be inspired. Don’t trace or connect the dots. Just create something. And then do it again. If you do it consistently enough, inspiration and discovery are guaranteed to occur. Get yourself used to acting forward, not merely thinking forward. Constant creators work with a continuous sense of urgency to raise the bar in every facet of their lives. They resist hitting the cruise control when something is working. And they rarely rely on existing road maps to direct future paths because they know the best road map is an ever-increasing awareness. Fall in love: A new creator will fall into the temptation of trying to orchestrate the perfect space and time to start creating, but that only impedes progress. He doesn’t yet understand love. When there’s love, creators no longer wrestle with the “wheres” and “whens.” The real matter at hand is the pursuit of the next creation, the next opportunity to display their love. Clearly, this sort of love gets messy now and then. You take it as it comes each day. When you don’t know where to find creative inspiration, it’s often because you’re not listening to your heart. 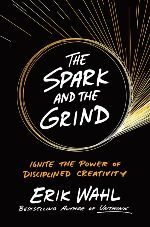 Creativity lives in your heart, and because that’s true, you can ignite sparks and grind them anywhere. Net Assets: How can business officers apply structure to the creative process? No creative routine worth embracing is simultaneously light on risk and heavy on reward. Wahl: You need to embrace a routine to be disciplined as a creator. For great artists, composers, writers and business masterminds, discipline is strategic. A mindful routine allows for fast progress and simultaneous flexibility to explore without an immediate deadline. This is a creativity conundrum: We need to be efficient and use our energy wisely, but in order to make progress, we also need to explore, ideate and create. Routine is the glue that holds them together. There has to be a constant willingness to let go — of assumptions, of current knowledge, of safety nets. But there must also be structure to make real strides in your creative efforts, enough to force you to take action and produce something, anything, on a daily basis. No creative routine worth embracing is simultaneously light on risk and heavy on reward. The creative process is risk and reward at once and all at once. It may hurt at first, but the more you do it, the less risky, rote and unreasonable it will feel even when your actual odds of failing haven’t changed. Fighting this fight is one of the most worthwhile battles in your life. Set about today to establish a routine, a rhythm, that allows you to maximize as much creative juice as possible every day, in every context. Allow your routine to become part of who you are, part of your lifestyle. When you experience its rewards, even only a few times, you will be ready to lean in further. In other words, you will comprehend what constant creators have known for centuries.